On a trip like the Conquest, there are countless moments that take your breath away. Whether a sunset on a deserted Australian beach, a pristine waterfall in the middle of no where in Vietnam, or a 9 year old firebreather on the streets of Saigon, the world has endless wonders with which to surprise and amaze. Unfortunately, the cosmic scales don’t tip endlessly to the wonderful. The other, darker side of the coin exists, balancing out the good with the most reprehensible evil imaginable. 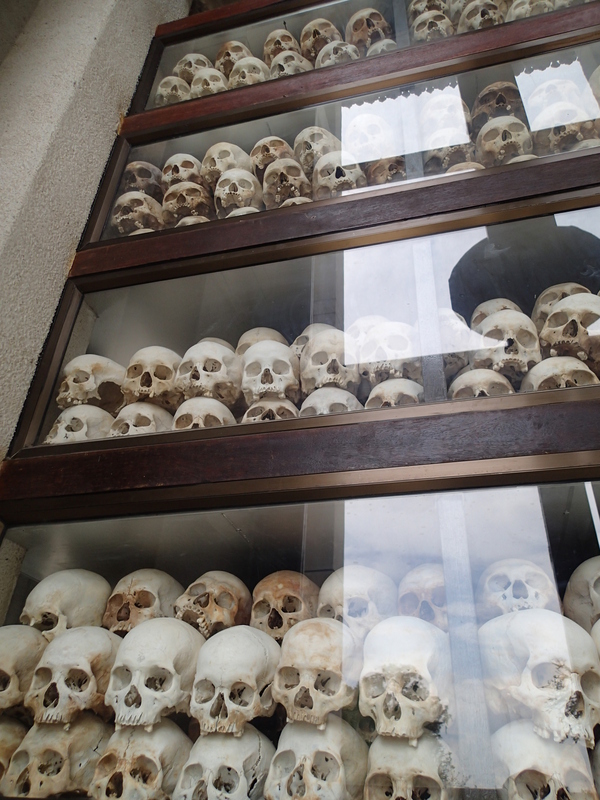 Here in Cambodia, I saw one of the most horrific atrocities that humanity has ever perpetrated against itself. A few levels of bones, they go 17 levels high. It was a sparse but totally accurate depiction. 16 years later, after exiting the boat in Phnom Penh after a 3 day ride up the Mekong from Saigon, I found myself in a position to deepen my understanding of one of the most nightmarish periods in human history. Pol Pot was born the wealthy scion of an upper class family in Phnom Penh. Educated in traditional French Colonial style, he was sent onto further his education in Paris, where he studied Radio and Electronics. During his time in Paris, he became enamoured with the local Communist group, and took up their ideology. 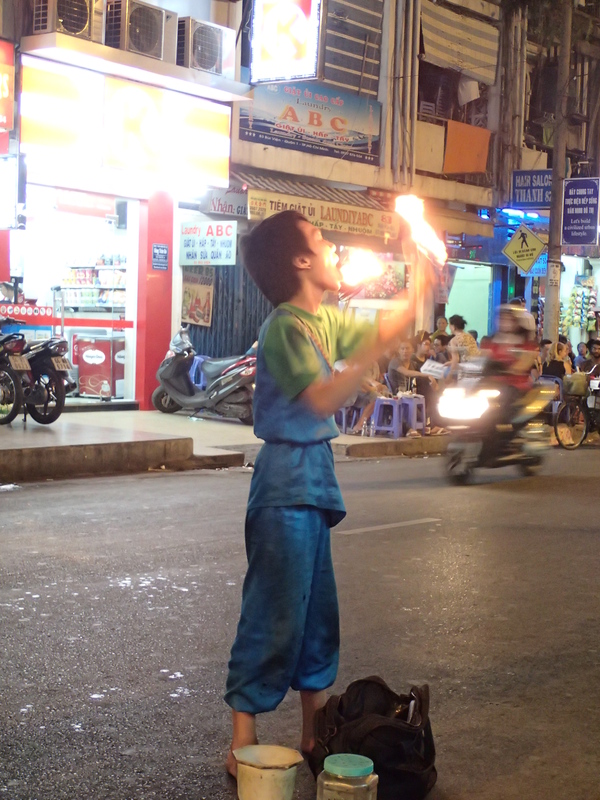 After his failing his exams 3 consecutive times, he was forced to come back to Cambodia. There he took up teaching, a profession which he would later attempt to exterminate. He kept in contact with a close set of associates that he had come upon in Paris, and worked to further Communist aims back home. In 1963, the French language and history teacher was voted the head of a Communist organization of less than 200 members. From this humble beginning, he forged the ferocious killing machine known as the Khmer Rouge. S21. 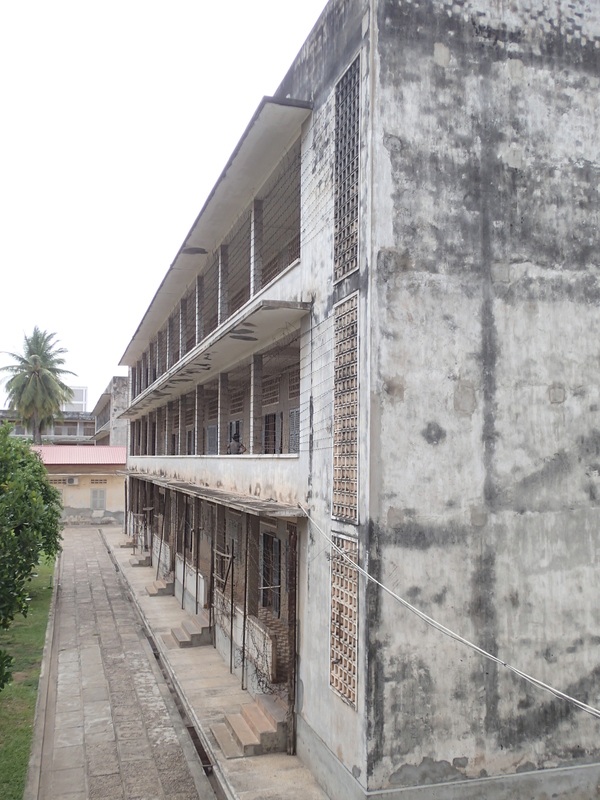 Former school turned torture facility. Barbed wire to keep prisoners from killing themselves. The aims of the Khmer Rouge were to throw off the yoke of colonialism/monarchy that they felt through King Norodom Sihanouk. They held the peasant farming class as the ideal of a Communist society, and actively fought against modernization of any kind, which they felt only exacerbated class distinctions. After waging guerilla warfare against the monarchy and subsequent democratic government, the Khmer Rouge captured Phnom Penh on April 17, 1975. An estimated 3 million Cambodians would be killed over the next four years. Rooms and rooms full of the faces of the victims. Cambodia’s total population was approximately 8 million when Pol Pot seized power. Choeung Ek was merely one of many “killing fields” where the Khmer Rouge disposed of “enemies of the regime.” Enemies of the regime included urbanites, the upper and middle classes, the educated, anyone with glasses, and towards the end, those whose hands were not “hardened from honest labor.” As a part of the Khmer Rouge’s rural utopian plan, the cities were totally depopulated, and citizens of every stripe were forced into near slavery conditions, laboring unproductively in the countryside. 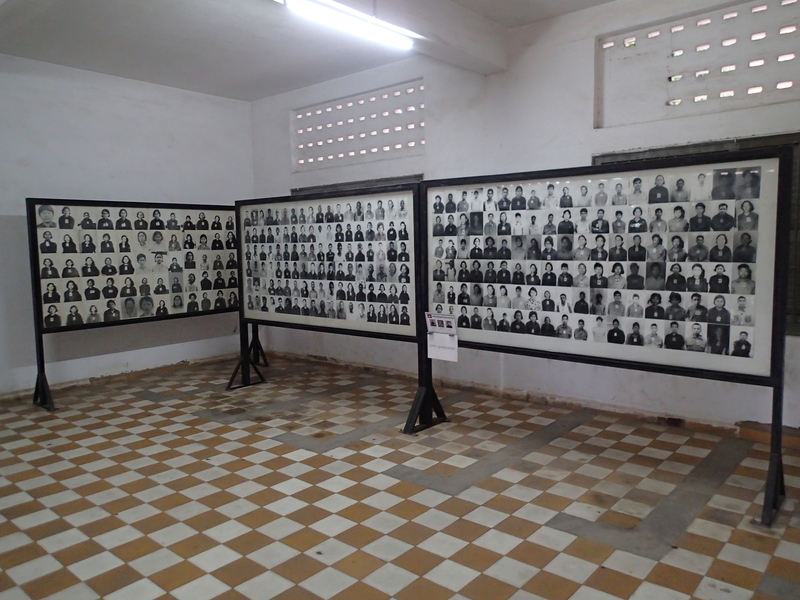 In 1990, Choeung Ek was designated as the primary memorial site for those lost in the genocide of the Khmer Rouge. Now a “stuka,” with the bones of the dead stacked in 17 levels, stands in the center of the now peaceful countryside which saw so many horrors a mere 35 years ago. This was not merely men, but women and babies as well. 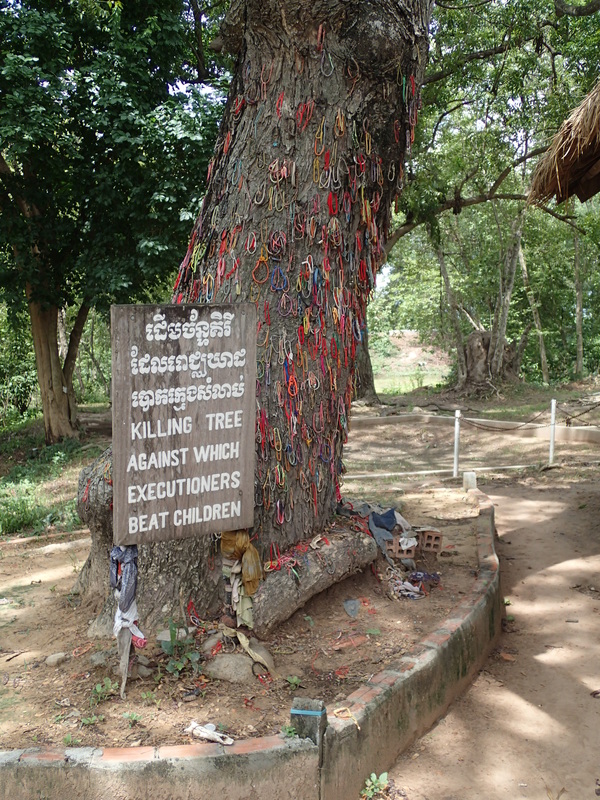 A popular propaganda phrase among the Khmer Rouge was “to destroy the grass one must dig the roots.” Tactically this translated into bashing the heads of babies against a tree before throwing them into a mass grave. The horror of that can’t be overstated. To stand next to a tree where men held babies by their feet and smashed them head first was one of the most guttural and brutal feelings I have ever received. This was pure, unadulterated evil on the most base level. The Khmer Rouge was eventually overthrown after 4 years of genocide by the Vietnamese, however the rest of the world still treated the Khmer Rouge as the government in exile until 1990. The perpetrators of this horror were granted a seat at the UN, strolling the streets of NYC with diplomatic immunity. Justice apparently only has a place in the world of international politics when it is convenient. Cambodia has largely recovered after losing 2 generations to the nightmare that was the Khmer Rouge. Phnom Penh is the most modern city I’ve seen since leaving Singapore, and the unfailingly positive attitudes of the Cambodian people is a big reason why. Like Vietnam, they refuse to let the past define them, but they demand acknowledgement of the horrors that happened in this beautiful country. 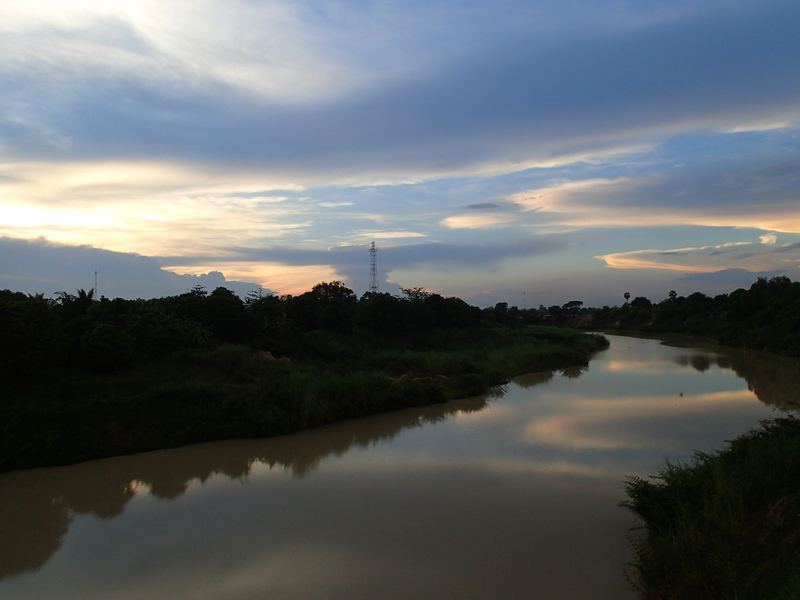 The day after I went to the Killing Fields, I took a sunset 4-wheeler ride around the area. The peaceful serenity was punctuated with the smiling faces of little Cambodian children, waving and screaming hello as if I were some movie star. There were women in brightly colored headscarves driving cattle, and groups of men huddled around laughing at the Cambodian dubbed version of Baby Got Back. 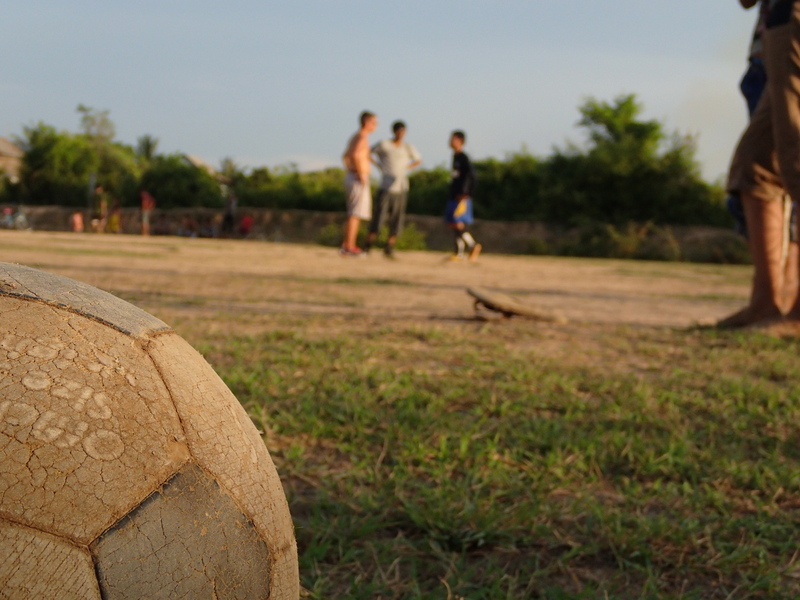 As we neared the end of the trip, I noticed a large group of kids playing soccer with some homemade goals. I pulled off the road to stop and watch, and snap a few pictures. Within a few minutes, one boy, named Chanra, came over and asked if we’d like to play. I’m certainly not my brother’s equal with a soccer ball, but I figured what the hell. 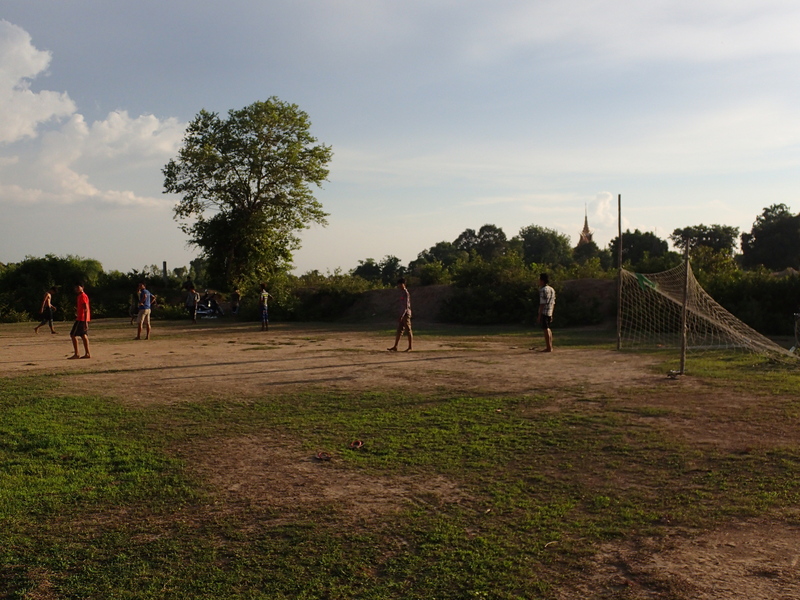 We played with the kids for about a half an hour, sweating our brains out in the slowly dropping sun. I looked over, and saw the stuka at Choeung Ek looking back at me. Of all the moments I’ve had on the Conquest this far, this was the most powerful. Literally in the shadow of a place which saw some of the most gruesome crimes against humanity a mere 8 years before I was born, we played soccer together. Khmer, American and British Indian, laughing and horsing around. It was yet another lesson in not letting the past define the present. There is only one day that we have control of, and that day is today.